Jon-Paul Gilhooley was a schoolboy from Huyton, and travelled with his uncles, Brian and John Gilhooley, who both survived. He was the older cousin of Steven Gerrard, the Liverpool captain, and the youngest to die at Hillsborough. Our son, Jon-Paul Gilhooley, was born on 25 October, 1978. He died at Hillsborough when he was 10-years-old. Jon-Paul has a brother, Ronnie, who is three and a half years older. I had an easy birth with Jon-Paul, despite him being a big 9lb baby. He cried quite often as a baby because he was always hungry. The local priest came around to visit a few days after Jon-Paul was born and took a picture of him because our son was the first baby he had met that had been named after Pope Jon Paul, following the Pope's appointment in 1978. His picture was featured in the Catholic Pictorial. Jon-Paul was a placid, relaxed baby. When I had my first son, Ronnie, people used to say to me that 'You're not dressing a doll', but I didn't get those comments when Jon-Paul came along. The boys idolised their dad, Ronnie. He had to travel for his work but would spoil them when he came home at weekends. We would always go out for the day when Ronnie was back for the weekend. One day, Jon-Paul drew a picture in school. He had to do something about the family, so he drew a picture of his dad driving a lorry or tractor and he drew me standing with a frying pan at the cooker and reading a book at the same time. It made me laugh. I was always reading. Jon-Paul was very creative. One day he had been upstairs for a while, so I went to check on him. He had managed to paint the walls in the bedroom with my nail varnish. In his more constructive times, he loved to make toy robots and build Lego. Jon-Paul got on really well with his big brother Ronnie and they had their own bedrooms. Ronnie Jnr was only 14 when Jon-Paul died and has never recovered from losing his little brother at Hillsborough. Jon-Paul went to nursery and then school. He was good at school and enjoyed being there, but he was sports mad. He loved swimming. We took both our boys swimming from when they were three-months-old. I can't swim, but we took them to the swimming baths every Sunday. Jon-Paul loved all sports, but swimming and football were his favourites. The day of Hillsborough was the first time he had been to the swimming pool on his own. After Jon-Paul died, I was given all his swimming certificates from his school. The school was really good. Jon-Paul loved to play football and loved to watch all sports. His cousin is Steven Gerrard, captain of Liverpool and England football teams. Jon-Paul would have been very proud of Steven. Jon-Paul wasn't allowed downstairs in the morning without either his dad or I, but one day I heard a noise. When I went to see what it was, I found Jon-Paul downstairs watching the Seoul Olympics water polo team. He was pleased because there was someone called Gilhooley on the team. Jon-Paul was sociable and affectionate. We had parties all of the time. Jon-Paul loved any kind of party: birthday, bonfire, Halloween. Jon-Paul's dad Ronnie and I both worked so we were able to have lots of parties. I have four brothers and two sisters and Ronnie has seven siblings. Our family all lived close by. My sister, mum and dad lived a few doors down the road, so there was always an excuse for a party. Jon-Paul had a big party and cake for his First Holy Communion. He was delighted with himself. Lots of friends and family gave him money for his communion gifts. He made a fortune. One day, Jon-Paul asked me for a basket. I gave him my washing basket. He came back with six kittens in it. The kittens had been abandoned. At the same time, we had a dog called Snowy. He was an albino deaf dog, the runt of the pack. Jon-Paul had heard somebody was wanting to put the dog down, but he insisted that we had to have it. He was about seven at the time. When he brought the kittens home, Snowy was trying to get at them. The kittens were only a day old. We had to take them to the PDS. We told Jon-Paul that the PDS had a mother cat to feed them, so it was okay to leave the kittens there. Jon-Paul had lots of friends, but just a few very close friends that he met early in his school days. We would often just pack up a picnic and a bat and ball and take a group of friends to the beach. One of Jon-Paul's friends was a girl called Tasha. One evening, we were making plans to go to the beach on the following day and I told Tasha to ask her mum if she could come with us. Tasha arrived early next morning at eight o'clock and we all went down to the beach. Little did we know that Tasha hadn't told her mum where she was going and there was pandemonium when we got back home. Jon-Paul loved horses. He just decided one day he wanted to take horse riding lessons. We couldn't afford a horse, so the lessons were the next best thing. When we went to Butlins, they had donkeys on the beach and Jon-Paul loved them. We went to Mallorca a year later, but he didn't like it because there were no donkeys on the beach. He was only eight. There was a time when people were throwing away the picture of the crying child because there was a superstition that it caused fires. Jon-Paul started to bring them all home. I told him not to come down the path with them, but he kept saying that they were nice pictures. My niece Paula fainted when she was a bridesmaid for her sister Donna. Jon-Paul kept saying 'Awww, awww', when his dad told him Paula wasn't well. He was only two. Jon-Paul loved all his family. When he was eight, he went to a jumble sale and bought small bottles of perfume. He bought them for me, his two aunties and his three cousins. Jon-Paul was very loving and affectionate. Whenever he saw his cousins, he would always insist on giving them a kiss and a cuddle. The last time his cousin Paula saw him, he was at his Aunty Vally's house. He had just been to town with me to buy his Easter clothes. He was made up, showing everyone his new clothes. Jon-Paul regularly went to football matches. All of the same group that were on the minibus to Hillsborough always went to watch the football. I knew before 3.30pm on the day of Hillsborough that Jon-Paul was gone. I knew he wasn't coming back. But I think back and remember how lucky I was to have Jon-Paul. I have no regrets at all. You don't appreciate what you have - I would go back and I'd take those 10 years any time. 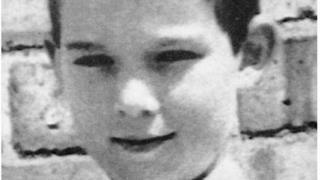 Jon-Paul had his life taken away at just 10 years old. He has been denied the chance of fulfilling his life, meeting new friends, getting married, carving out a career and having children. To the world, Jon-Paul was a football fan, but to us he was our world. Forever loved and missed.